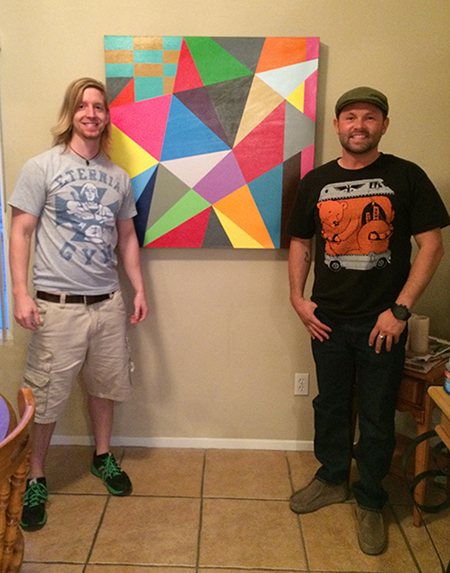 Visiting Ben and Jen in Las Vegas to see "Moment #5" in it’s new Home! After completing the KREASHUN mural in Las Vegas at the International Licensing EXPO on June 9-11th I was able to roll over and catch up with Ben and Jen at their home outside of the city. “Moment #5” from “The Nature Series” is in their collection. Ben is the son of Randy Edmonson who was my painting instructor at Longwood University. I last saw Ben over 15 years ago when he was 10 years old running around in Bedford Hall at Longwood. Ben is now also in the ARTS as a Graphic Designer and I am honored for “Moment #5” to be in his personal collection. It’s so awesome how years pass and “The PATH” continues. *Read a little about Randy Edmonson through the link below. Mr. Edmonson has retired from Longwood University now and is currently creating beautiful pottery, sculptures, and paintings in his mind blowing Farmville, Virginia based studio. After all these years, I continue to have an awesome friendship with Mr. E! I look forward to soon visiting his studio and creating together once again! *Articles below from Farmville/Longwood University projects with a few words from Mr. Edmonson.